I played at my home course Saturday morning. 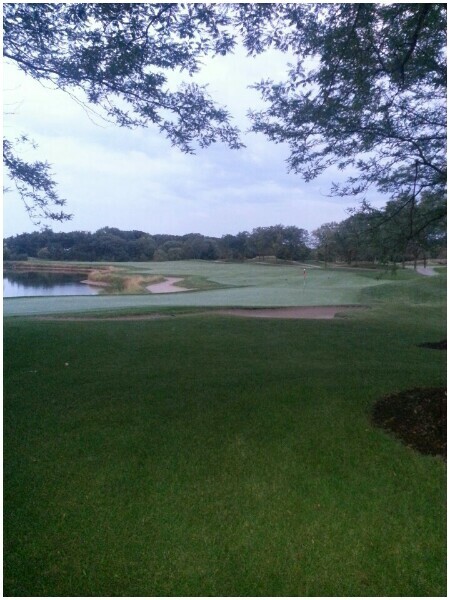 Orchard Valley in Aurora, IL. http://www.orchardvalleygolf.com This was a farewell to golf for August, 2013. We kicked in September golf the following day. Sunday afternoon I went back with one of my favorite playing partners, 11YO Cody. We played the front nine as a scramble, just the two of us. Here is Cody standing over our only birdie putt of the day. He missed it, alas, and then putted my ball and missed that too. We got a par on this hole, though. Cody driving on the par-4 6th hole that we parred. Cody standing on the 8th tee, a long par 5 with an elevated green at the end.